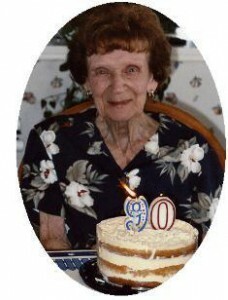 Bernadette I. Stern, 90, of Rockwall, TX, passed away May 10, 2007. She was born in San Francisco, California on June 12, 1916 to Francis and Margaret Barbian Klauer. The family moved to Milwaukee, Wisconsin where she met and married Henry E. Stern on October 13, 1957. After their marriage the couple relocated to Port Washington and raised their daughter. Henry preceded her in death May 30, 1982. After the death of her husband, Berni kept busy with friends, playing cards and traveling. She visited Kathi and her family in Texas two to three times each year until finally moving there in October 2005. Berni leaves behind to cherish her memory one daughter: Kathi Davis and her husband Roger; two wonderful grandsons: Taylor and Ryan Davis, whom she adored; three sisters-in-law: Ann Klauer, Mary Jane Stern and Luella Wellenstein; as well as nieces, nephews and friends. She was preceded in death by her parents; her husband; her brother: Frances “Bud” Klauer; and sister: Reynildis “Sis” Labisch. Reverend Patrick Wendt will celebrate a Mass of Christian Burial 7 pm Tuesday, May 15, 2007 at St. Mary’s Catholic Church, 430 N Johnson Street, Port Washington. Interment St. Mary’s Cemetery, Saukville. Visitation after 4 pm Tuesday at church. Memorials may be made to St. Mary’s Catholic Church.